But believe it or not, you can make a Buffalo wings-inspired dip so lean and clean that it can pass for a healthy snack! In this skinny Buffalo Chicken Dip recipe, shredded chicken breasts replace the fattier dark meat, and a combination of Neufchatel (look for it next to the cream cheese in the grocery store) and Greek yogurt give it the creaminess of a dip. We added part-skim mozzarella to make this dip cheesy, but you could substitute part or all of that for more Greek yogurt to make yours even leaner. Tangy hot sauce and a little bit of crumbled blue cheese create the familiar flavor of Buffalo chicken. Combine everything and bake until bubbling; serve hot with raw veggies like celery sticks, baby carrots, cherry tomatoes, or cucumber slices, and enjoy! Pro tip: Put this Skinny Buffalo Chicken Dip together quickly using leftover baked chicken breasts or shredded rotisserie chicken. 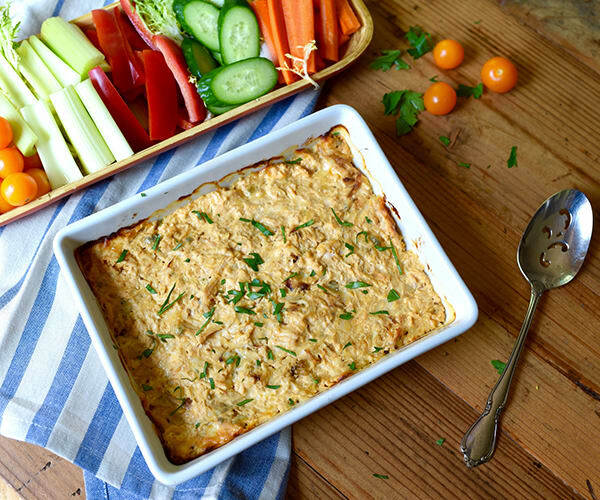 To make this healthier Buffalo Chicken Dip, we've combined cayenne pepper hot sauce with two creamy cheeses, and yummy blue cheese crumbles. Combine Neufchatel cheese, yogurt, mozzarella cheese, hot sauce, blue cheese, and chicken in a medium bowl; mix well. Place in a 1½-quart baking dish that is lightly coated with spray. Bake for 25 to 30 minutes, or until cheese is melted and edges begin to slightly brown. Serve immediately with raw vegetables for dipping. A protein and veggie dip as part of dinner or a snack(tional).